With the Lok Sabha recently passing the National Food Security Bill (NFSB) that promises subsidised foodgrains to 75 percent of the rural population and 50 percent of the urban population, India is under huge pressure to significantly increase its cereal grains production. One such method of doing so is through the accelerated adoption of hybrid technologies, including hybrid rice. Hybrid rice has the potential to significantly increase rice yields, often to the order of 15-30 percent relative to local or even modern high yielding varieties. These higher yields allow for more intensive rice production, thus allowing farmers to either produce more output on a particular plot of land or to diversify into higher-value crops like vegetables and other horticulture crops. Both strategies potentially result in higher farm incomes and more abundant food supplies that can stabilise prices for both urban and rural food-insecure households. The government of India has set an ambitious target to increase the area under hybrids to 25 percent of total rice area by 2015. Despite these promising results, the pace of hybrid rice adoption in India has been slow, particularly in comparison with experiences in China. At present, over half of all rice area in China is under hybrid rice, resulting in improved food security for an estimated 60 million people per year. 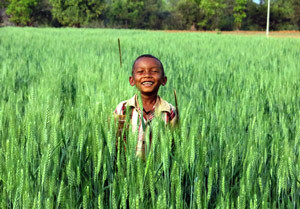 The adoption of hybrids has been much slower in India, with only about 7 percent of rice area under hybrids. The low rate of adoption is largely due to poor grain quality and the resulting low market price, difficulties in achieving high rates of heterosis in tropical hybrids, high hybrid seed cost, limited availability of quality seeds, and hybrids not suited to ultimate consumers’ tastes and preferences. These are just a few of the main challenges facing the expansion of hybrid rice in India.